are: Bisquick, sour cream, Seven-Up, and butter. Really, that's it! Only, I didn't have Seven-Up, so I substituted ginger ale. Boy, I was really stretching it. First I was starting with a recipe I had little hope for and I was subbing ingredients. So, I tried really hard to follow the rest of the recipe no matter how bizarre it sounded. Step 1: Melt 1 stick of butter in 9x13" pan. Really? The butter doesn't go in the recipe...just in the bottom of the pan? 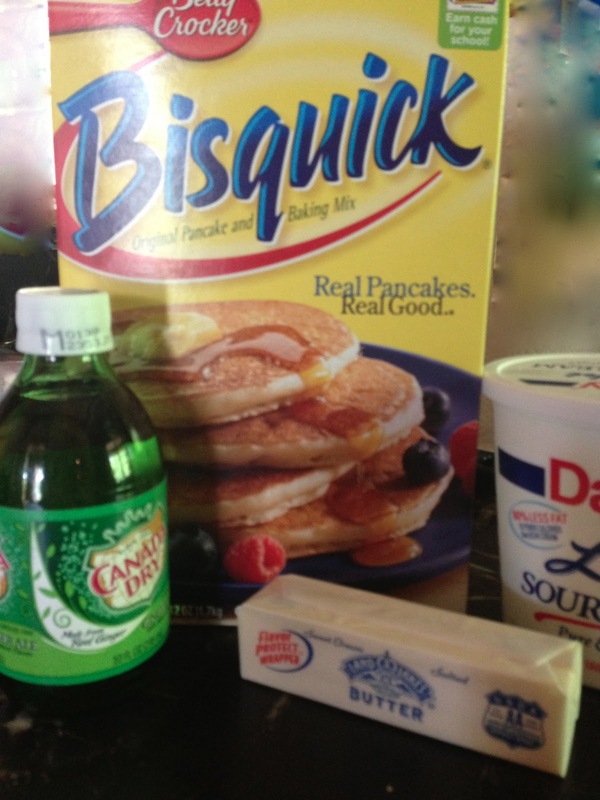 Step 2: Mix together 3 cups Bisquick, 1 c. sour cream and 1 cup Seven-Up...ummm Ginger Ale. Mix just until combined. Step 3: On a floured surface (I used the Bisquick to flour the surface. I was all in with the Bisquick at this point.) knead the dough 3-4 times. Step 4: Roll out dough to about a 1" thickness. Step 5: Cut out with 2" biscuit cutter. Step 6: Place biscuits on top of the butter in the pan. I got 15 biscuits out of my dough and they fit perfectly in the pan in 5 rows of 3 biscuits. Step 6: Bake about 15 minutes in 425° oven until the biscuits are golden brown. Pulling the biscuits out of the oven, I was first impressed with how pretty they "looked". They had risen admirably and looked fluffy and golden. Moment of truth...I took one out and broke it open. It was good! Really good! But would my picky family agree. Remember there were 15 biscuits? I ate one... for testing purposes, of course, so that left 14. My youngest walked into the kitchen, grabbed a biscuit, took a bite (I'm watching intently for his reaction), he looked at me and said, "pretty good!" (which in teenager speak means "great! "), and he piles 3 more on his plate. So far, so good! Now there are 10 biscuits left. My oldest son runs in saying he has to go mow the grass. So I offer him a biscuit before he goes out the door. He reluctantly takes one (can you tell how my past biscuit making has gone? ), says, "pretty good!" and out the door he goes. That didn't seem like quite as good of a reaction, but wait! No sooner than he ran out the door, he ran right back in, yelled, "hey, mom, those biscuits are good! ", grabbed 3 more and ran out the door with them. Wow! Are you keeping up with the math? Now I only had 6 biscuits left. Ok, two opinions down, one to go! When my picky husband gave them the thumbs up and grabbed two of the remaining biscuits, I knew this recipe was a keeper. Out of the 15 biscuits I had started out with, I now only had 4 biscuits left. My family had never eaten 11 biscuits at one time! They were so good and so easy, I decided to whip up some yummy strawberry jam to go with the biscuits the next time I made them. I mean, when you are making biscuits that easy, you have time to spend on homemade jam. 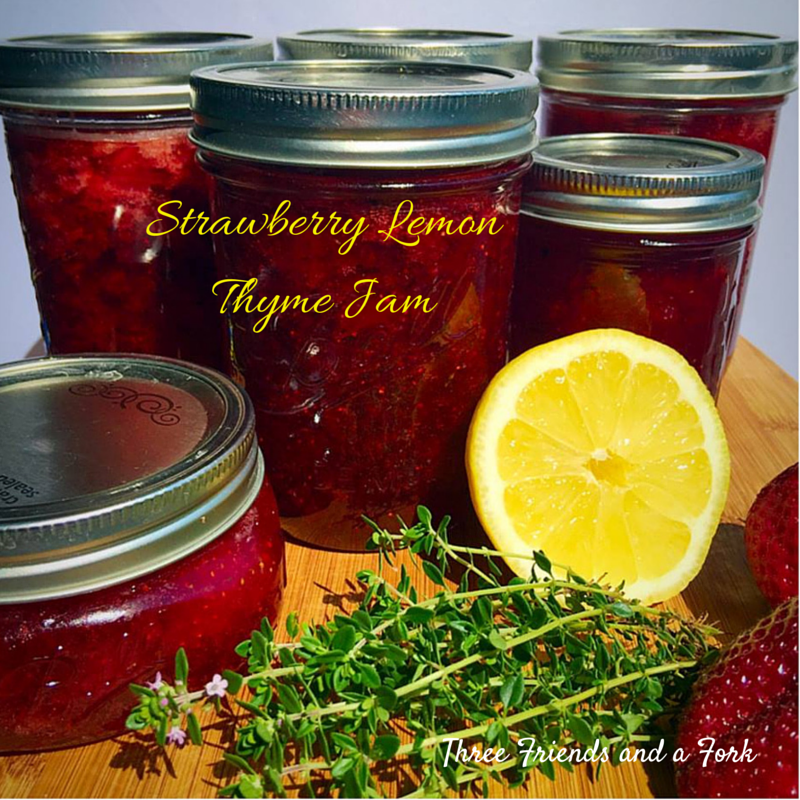 The jam I made was a lemony thyme flavored strawberry jam recipe I found a few years back in one of Paula Deen's magazines. It sounds kind of fancy, but it is a really easy recipe, too. I had gotten a big bucket of local Maggie Valley strawberries, so I got them out, washed and stemmed them with a straw and squished them with a potato masher. I measured out 5 cups of mashed strawberries and put them in a large Dutch oven along with 1 T. lemon zest, 1 box of powdered pectin, 5 T. lemon juice and 1 T. fresh thyme leaves (I picked these out of my garden). I stirred everything together and brought it to a boil. As soon as the berry mixture started to boil, I added 7 cups of sugar. Then, stirring constantly, I brought the mixture back to a boil and boiled it for 1 minute. While the berry mixture was steaming hot, I poured it into 8 sterilized half pint jars. That's it! Try these two recipes out and let me know what you think. I promise, you have "thyme" for these easy recipes! Here's your list of ingredients for each recipe.